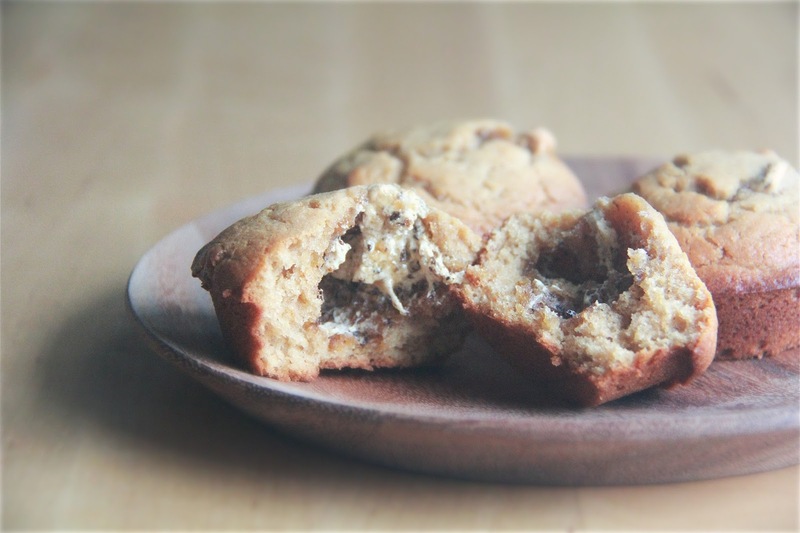 Crumbs and Cookies: peanut butter marshmallow-filled muffins. At my house, there is no shortage of the essential baking ingredients every frequent baker should have. I always have one-kilo bags of flour stocked up in my storeroom, and there would be three types of flour- plain, cake and bread. Occasionally a bag of rice flour would pop up. You can unfailingly find my fridge containing no less than five blocks of butter; right now there are eight. And when the mood strikes, cream cheese. My mum buys sugar by the two-kilo bagfuls. Recently, it seems like peanut butter is becoming a hot commodity in my household too. I opened my fridge yesterday to find no less than three plastic jars of peanut butter, each of a different kind. There's Skippy Super Chunk, Skippy Creamy and Jif Creamy. And get this, all three were opened and half-finished. I mean, which family does this?! P.S. I love Jif's creamy peanut butter. It wasn't that I felt like I had to use up at least one of the jars of peanut butter to clear some space in the fridge, I just had a massive craving for something peanut-buttery when I saw the jars of peanut butter. And while I thought of what to bake, I swiped a sizeable spoonful of Jif. And while I was standing in front of the fridge, door opened, I saw a half-opened pack of marshmallows. Lightbulb moment. Thus, these muffins were born. It took a long time for me to decide which recipe to use. I googled peanut butter muffins but the results were quite different from what I wanted. 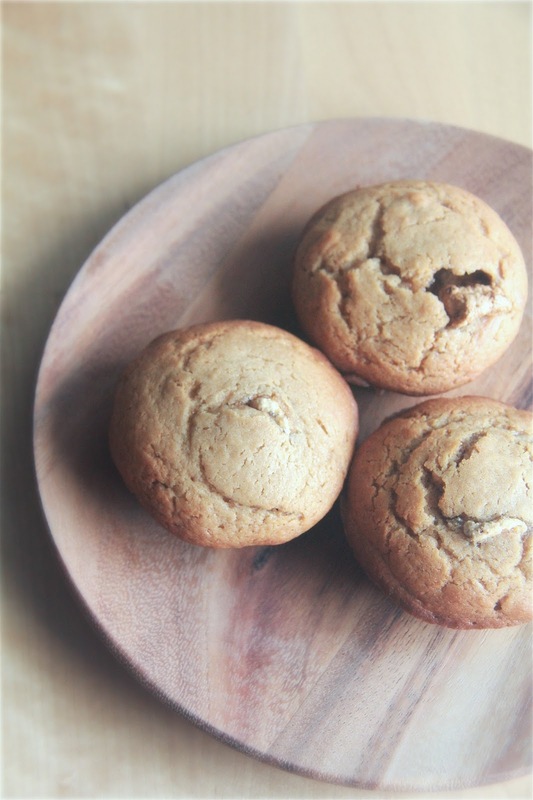 For starters, there were many recipes for peanut butter banana muffins, peanut butter and honey muffins, healthy peanut butter muffins (no interest, thank you), but barely any for a plain peanut butter muffin. Of course, I took into consideration recipes like peanut butter chocolate chip muffins because I could just omit the chocolate chips. But even still, I couldn't find an appealing recipe. So I decided to search for peanut butter cupcakes instead. And there was a world of difference. There were so many suitable sources I could choose from that I was in a bit of a fix, frankly. In the end, I decided that the recipe I choose had to contain baking soda, for fluffy muffins. It must also have a high ratio of peanut butter to butter, because I wanted these muffins to be the very ambassador of peanut butter. I could decide if I wanted to use a recipe with melted butter or oil, or creamed butter. It was a hard toss-up between this recipe and this recipe, and in the end, I went for the one with the creamed butter, as it is more likely to yield the crunchy muffin tops I love so much. And it did! I loved these peanut butter marshmallow-filled muffins to the core (note the marshmallow middle reference too). 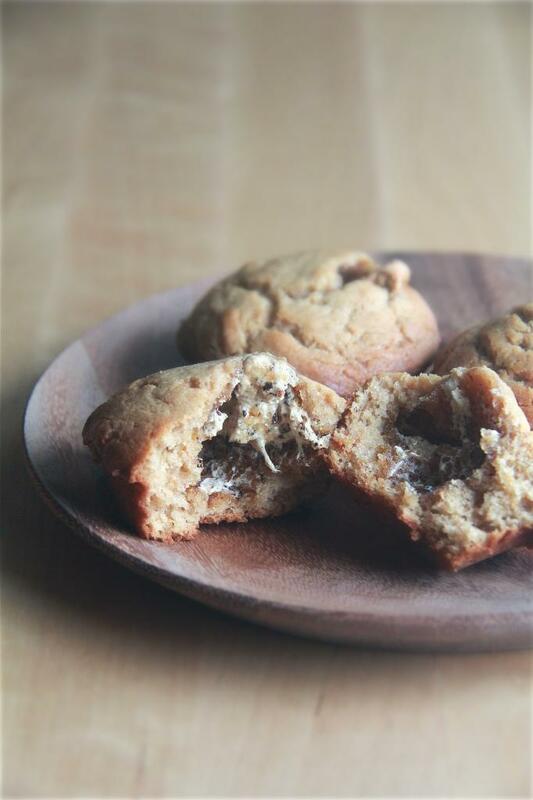 They were sufficiently peanut-buttery, fluffy, moist and the tops were scrumptiously crunchy. Plus, they had gooey marshmallow centres! Can you say perfect fluffernutter muffin? You need these in your life. Please. 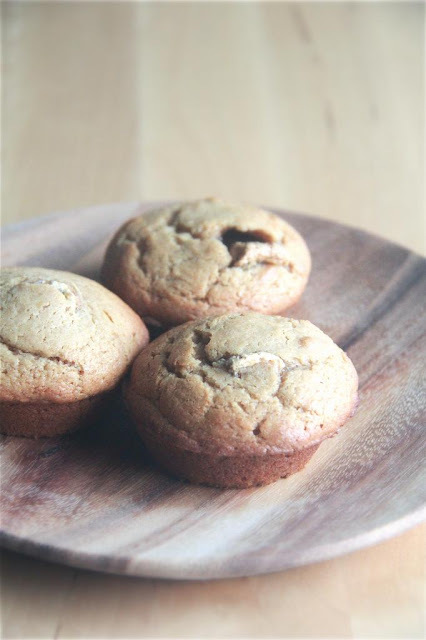 I made these muffins in shallow muffin tins to get more crunchy tops and less "stumps". Make sure you let the muffins get sufficiently browned or the tops won't be as crunchy! Turn the heat up to 400F for the last 2 or 3 minutes of baking time to achieve that if they've yet to achieve your desired coloration. Preheat oven to 350F. Prepare mini muffin tins. Whisk the flour, baking powder and baking soda together. Cream the butter and peanut butter together until smooth. Add the brown sugar and salt and beat until lightened and fluffy. Add the vanilla extract and stir to incorporate. Add an egg and stir to incorporate fully before adding the next. Add half the flour mixture and stir just until combined. Blend in the buttermilk. Stir in the rest of the flour mixture. Halfway fill each muffin cup, press a marshmallow into the centre and cover with more batter. Bake for 12 to 13 minutes or until an inserted skewer comes out mostly clean, with just a few moist crumbs attached. Cool in the muffin tin for about 5 minutes before unmolding onto a wire rack. Eat immediately.